Another enjoyable instalment in Anita Blake's saga. Blue Moon has a good storyline, plenty of action and a great cast of characters. 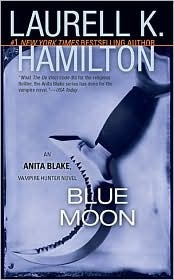 As well as being a story within itself, this book also advances the overall plot, particularly regarding the triumvirate and Anita's relationship with the werewolves and wereleopards. This is the last of the Anita Blake books I have in my shelf, so I'll take a break from them for a while and perhaps try to get a few more later in the year.